Sometimes it takes a lighthouse to help you find your way. We woke up late and to a beautiful day. 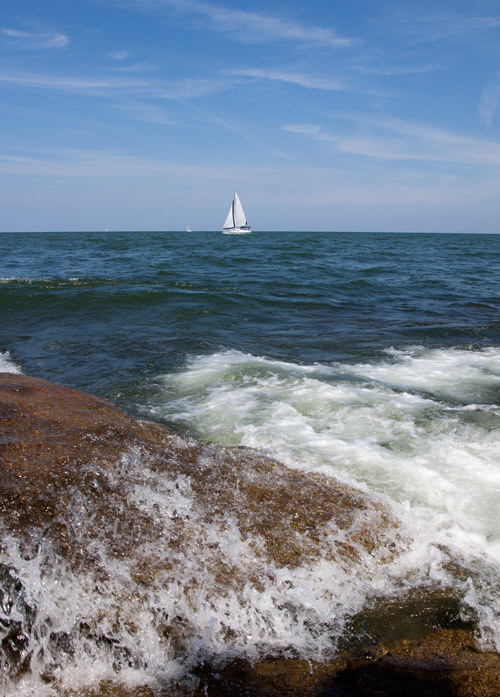 The first thing She suggested was a visit to the East Harbor State Park on the Marblehead Peninsula in Lake Erie. We'd only recently heard about the park and were interested in checking it out. Well, long story short, it seems to be a fine and popular beach but the mapped nature trails were not well signed and extremely difficult to find. We spent little time there and decided to move along to the little town of Marblehead. Marblehead (map) is really kind of a stepping off port for those who wish to fish, enjoy the party island of Put-In-Bay, or relax in the quieter environment of Kelly's Island. The town does offer its own assortment of gift shops, antique stores, and eating places. Lunch for us, however, was a disaster. We found a pizzeria that offered a pleasant atmosphere and had a "Veggie Delight" pie on its menu. After what seemed a very long wait –we arrived with the rest of the lunch crowd– our pizza arrived. I took one bite and the first impression was good. Then a particular texture and flavor filled my mouth and triggered an old memory… pepperoni! Our "veggie" pizza was really a pepperoni pizza with some veg toppings scattered over the meat! We were hungry but, as vegetarians, to us the pie was inedible. We refused the offered discount explaining it was a meat pie served to herbivores, and were then told we owed nothing. Nice waitress, dumb kitchen. Eventually we stopped in at the small local grocery. It's a convenience for locals and an important source of provisions for visitors. We discovered a tub of prepared hummus, some whole wheat flat bread, and a vast array of very cold drinks. We gathered our purchases up and had a picnic in a public park which, as it happens, was right behind the pizzeria. Delightful and delicious. Following lunch we headed to the Marblehead Lighthouse. 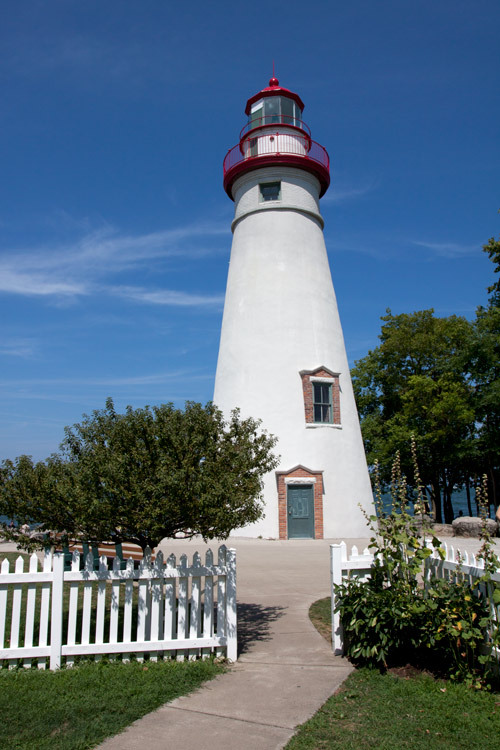 The Marblehead lighthouse used to be a lonely monument to bygone days of maritime technology — quietly standing on its rock foundations, posing for pictures made by occasional visitors. In 1998, however, the light and adjoining property became a state park. We were astonished today at the number of people enjoying the little park, the ca. 1821 lighthouse, and the Lake Erie surf splashing over the light's rocky foundations. The scenery, the beauty of the day, and the lake breeze made the day. We returned home happy. It sounds like you had a wonderful day, good food, beautiful scenery, delightful company. Who could ask for anything more? ?